Today is passenger change day. We have new neighbors on either side of our suite. While the crew worked to get the ship ready for the new passengers this morning, we took a "Panoramic Tour of Hong King." It was another foggy day, so our photos are not as good as we hoped, but we enjoyed the bus ride. Our guide had a great sense of humor and used it well as he told us about Hong Kong and it's history. 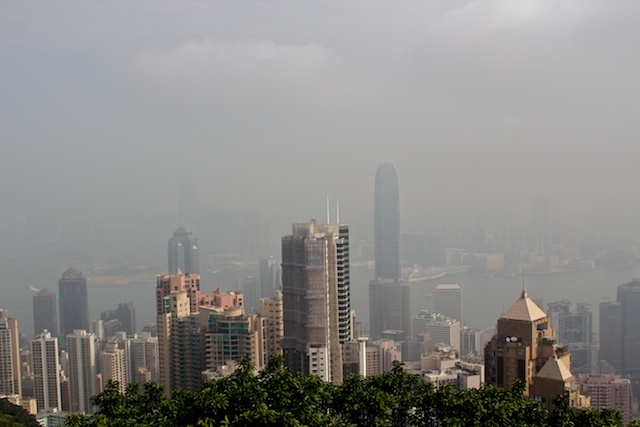 The first destination was to Victoria Peak. The observation point is not at the very top, but our guide assured us that the view is better from the lower vantage. There is a tram that visitors can take up to the top, but that wasn't included in our tour. As you can see from this photo Ray took, it probably wouldn't have made any difference. The haze obscured all but the closest buildings. 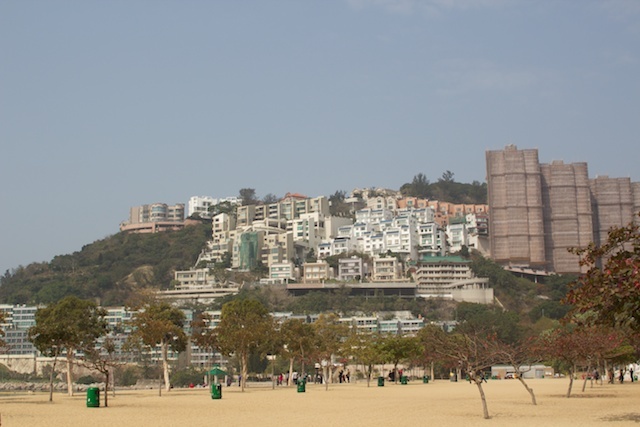 Next, the bus drove us to Repulse Bay. This is the area where the really wealthy residents live. It has a lovely beach but the main reason this location is so desirable has to do with the principles of Feng Shui. The literal translation of this term is wind-water. This bay is sheltered from the wind by the hills. Dragon spirits are supposed to be carried on the wind and stopped by water. One of the prominent buildings here was designed with a hole in the center. Our guide said that there are 2 theories for this. One is Feng Shui, allowing the dragon spirit to get through to the water. The other theory is that it was designed this way for structural reasons. Since none of the other buildings in the area have this feature, your guess is as good as mine. When we left the beach we drove to the far end of Hong Kong to where he new airport has been built. 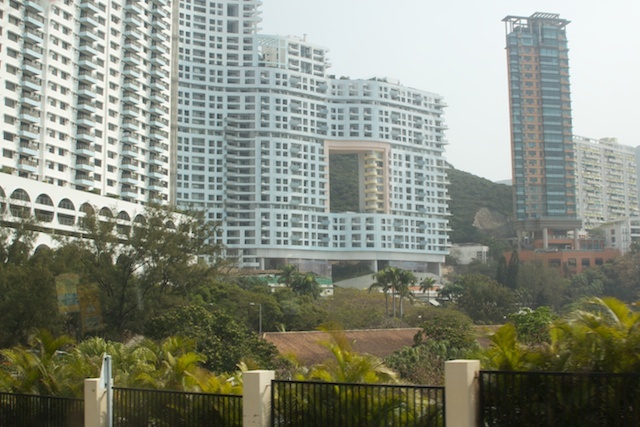 Our guide pointed out where a local amusement park, Hong Kong Disneyland, a fishing boat village, and various buildings and neighborhoods along the way. It was difficult to get photos of any of this from a moving bus. We got a brief glimpse of the airport and saw where a new railroad terminal is being constructed for a rail line from Hong Kong to Beijing. Our guide said this will be a 20 hour train ride. We finally stopped at the base of the" Ngong Ping 360" cable car ride. This takes tourists up to the Po Lin Monastery and the Tian Tan Buddha, also referred to as the Big Buddha. Of course, the tour didn't include this either. The photo here is all we saw of it. I think this was more a bio-break stop than anything else. From there we drove back to the ship, noting several nice bridges along the way. Overall, this tour lived up to it's description as "panoramic" and got us out of the way of the crew for a few hours, but wasn't anything exciting. We had lunch on the ship, then headed back out to the mall this afternoon to see what we could find. This was a nice walk and we got lost in the maze of halls for awhile, but didn't buy anything. All we accomplished was to tire ourselves out. I think we are going to order a light dinner into our room again tonight. 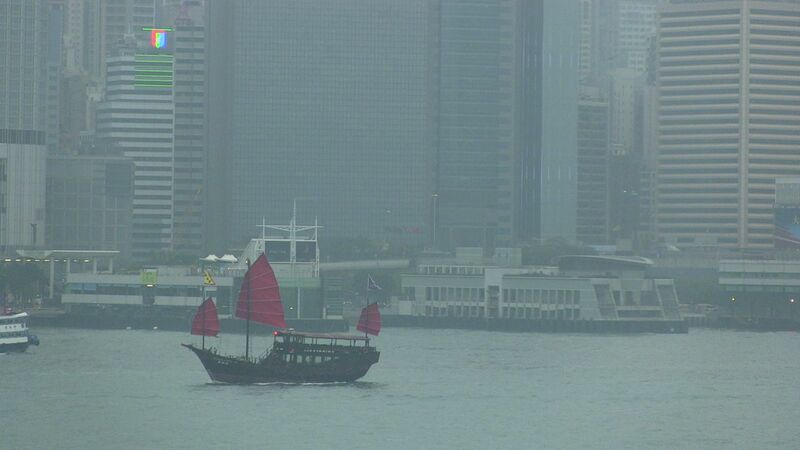 Our ship sails away from Hong Kong at 10pm tonight. I would like to share one last photo from here - a junk we saw traveling back and forth across the bay this morning during breakfast.